"Tea at four. Dinner at eight. Murder at midnight." 'Gosford Park' is a 2001 British comedy-mystery in the tradition of whodunit, Edwardian ensemble, and classic English cozy. With a cast of theatrical and cinematic giants such as Dame Maggie Smith, Eileen Atkins, Clive Owen, Ryan Philippe, and Kristin Scott Thomas, the script by Julian Fellowes and direction by Robert Altman showcase the goings on (and untimely death of a Peer) during a weekend at a English country estate. Sir William McCordle (Micheal Gambon) invites illustrious guests to his country home, Gosford Park. Every guest has an ulterior motive, whether financial, sexual, or revenge. Countess Trentham (Maggie Smith) seeks to safeguard the allowance she's long received from her brother, Sir William. Lady McCordle (Kristin Scott Thomas) seeks excitement and fulfillment outside her marriage, entering into a nightly tryst with a young country hunk/actor, Henry Denton (Ryan Philippe). Upstairs and downstairs, a legion of devoted footmen, maids, and cooks see to the comfort of the McCordle family, and the care of Gosford Park. Two sisters, Mrs. Wilson (Helen Mirren) and Mrs. Croft (Eileen Atkins) skirt one another, bumping heads inevitably, but otherwise avoiding each other as much as possible. They are family with lots of bad blood between them, and the blood in question has Sir McCordle's name written all over it. The particulars, however, are brilliantly overshadowed by Sir McCordle's murder at a party one night. Not until the final scene is the entire back story revealed concerning the true nature and intentions of Gosford's glittery guests. Along the way, Henry Denton is exposed as a sham, and an American to boot. The man whose valet he posed as, Morris Weissman (Bob Balaban), turns out to be his sugar daddy. Meanwhile, a housemaid (Emily Watson) cozies up to Sir McCordle, but when she defends his personal matters one day, she reveals their affair and is banished from the house. Soon after, Lord McCordle is found murdered. The movie's remainder centers on discovering the murderer. 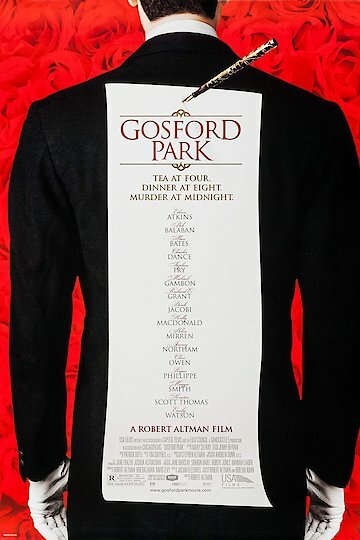 Gosford Park is currently available to watch and stream, download, buy on demand at Amazon Prime, Starz, Amazon, Vudu, Google Play, FandangoNow, iTunes, YouTube VOD online.